Heat oil in a pot. Saute onions and garlic. Toss in tofu, carrots and sotanghon noodles. Season with salt and pepper. Cook for about 5 minutes. Add in the rest of vegetables. Cook for another 2 minutes. Turn off heat. Serve hot. Garnish with green onions. I haven't tried baking a home-made ham. It takes a lot of preparation so I'm not up to it yet. 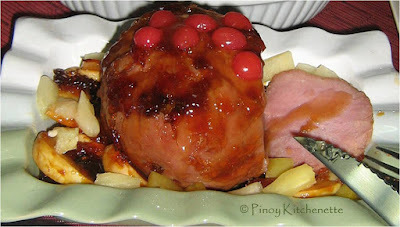 I usually have the store bought glazed ham, the purefoods fiesta ham in particular. It's already tasty and nice flavored by itself, but I do want it coated with a richer glaze. So I always rely on with this favorite homemade glaze I've tried for quite a few years now. Some store-bought hams comes with a small pouch of pineapple glaze. But that wouldn't be enough for the kind of glaze I want. I want the sweet glaze to compliment with the salty flavor of the ham. So here's what I do.. In a heated pan, mix together a cup of crushed pineapple, 1/2 to 1 cup of pineapple juice, 1/3 cup honey , 2 tbsp brown sugar, one clove garlic (finely chopped), 1 tsp dijon mustard and a pack of pineapple glaze from the ham package (if any). Cook and let the mixture boil. Set aside. Place the ham in a baking pan, and add some sliced apples around the ham. Pour about half of the glaze mixture over the ham. Bake the ham at 175°C (oven must be preheated before baking) for about 30 minutes. Remove the foil, put the remaining glaze into the ham, leave the pan uncovered and bake for another 30 minutes or until you achieved your desired golden glaze. If preferred, you can put the juice from the ham drippings (from baking) and the baked apples in a blender for a smoother gravy. Or just leave it as is and serve. To serve, garnish the ham with cherries and fresh pineapple, apples, peaches or any fruit you want. Filipino Catholics headed to church very early this morning as today is the start of the Simbang Gabi, a nine-day novena which starts from December 16 to December 24. "The Simbang Gabi originated not just out of devotion, but also due to practicality. In the early days of Spanish rule, it was the customary tradition to hold novenas in the evenings during the Christmas season. However, the friars and the priests saw that the people attending the novenas were tired and numb from work in the fields, even though they continued to want to hear the word of the Lord. This was because in the Philippines, an agricultural country, families started their day even before the sun would rise to avoid the inhospitable temperatures in the fields. As a compromise, the clergy began to hold Mass early dawn when the land would still be dark, a break in tradition prevalent in Spain and her Latin American colonies. Filipinos came by the countless multitudes to the Simbang Gabi. Afterwards, it became a distinct feature in Philippine culture to celebrate Holy Mass at such a rather early time. In time, Simbang Gabi became a symbol for Sharing, in both hardship and happiness, for the largely Catholic nation." 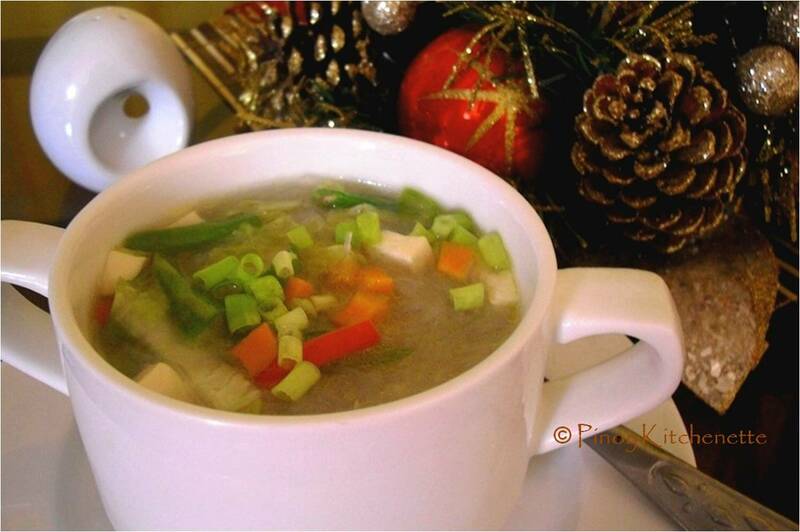 Philippines is distinctly known as country with the longest celebration of Christmas. As early as September (which is the first day of "ber" months), you'll hear christmas carols. And we usually put down the parols, Belen and other christmas decors after the celebration of Epiphany or January 6, which marks the end of Christmas season. 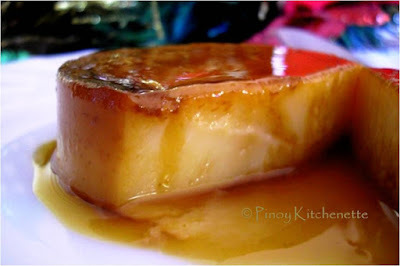 I used 2 oblong molds (llanera) and 6 small round molds for the above flan mixture. In a bowl, put the yolks, beat slowly. Then add evaporated milk, condensed milk, vanilla extract and calamansi (or lemon rind if you're using one). Mix slowly. Avoid creating bubbles. Just mix it nice and slow. Steam for about 30 minutes. You can tell if it's cooked through inserting toothpick, if it comes out clean then it's cooked. Let the flan cool. Then refrigerate. It sure is worth the wait. To serve, gently turn the mold upside down. Now you see, the sweet golden caramel on top and some dripping on the sides. Enjoy a melts-in-the-mouth leche flan! 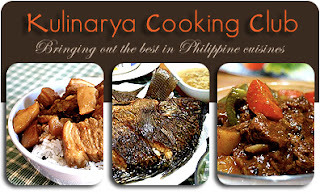 This is my recipe for the Kulinarya Club, which tasks us to share one of our star recipes for Noche Buena. 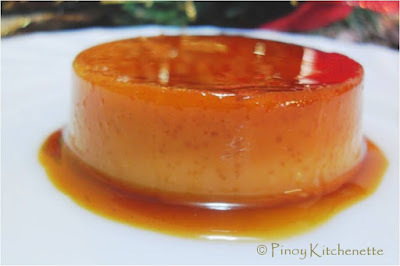 This simply is it, my leche flan coffee caramel. 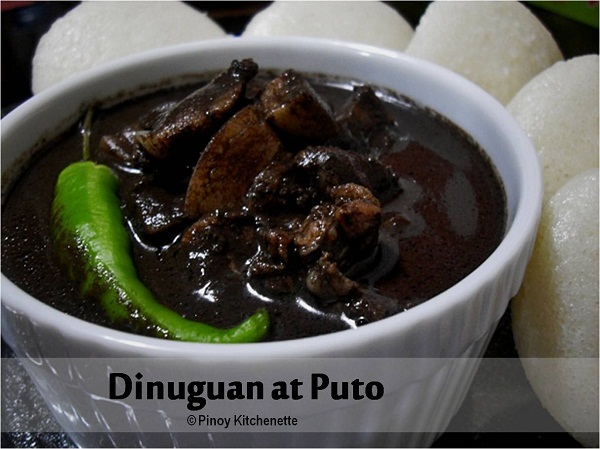 My family's Noche buena isn't complete without it. 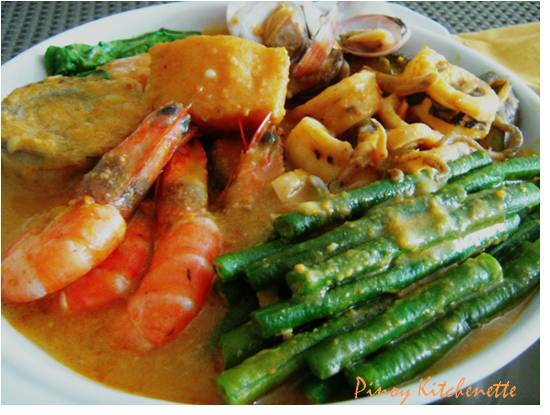 Seafood Paella has also been part of my family's Christmas dinner tradition. My daughter has started to like glazed Ham (she even calls it "the noche buena") so I guess we won't be skipping with that, too. I would also like to try the Kinulob na Itik (deep-fried duck seasoned with secret spices ) which is one of Victoria, Laguna's specialty . There's a new branch near our place, so I might as well try it. they said it really tastes good. But let us not forget, whatever food we prepare, the more delicious and sweeter it is when it's shared with the whole family. Let us not also forget the real essense of Christmas spirit which teaches us to love, to share and to forgive. Let the brightest Star of Christ shine among us all. 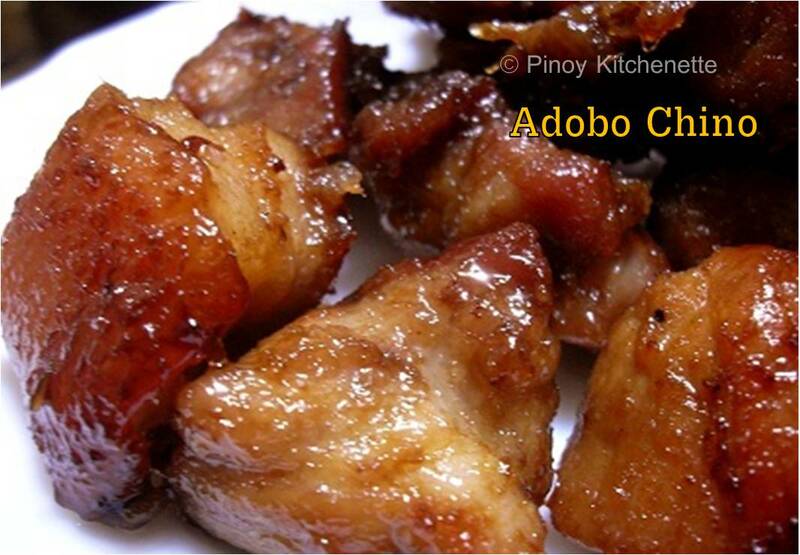 Igado is one of the best tasting Filipino food, with its salty-sour flavor. 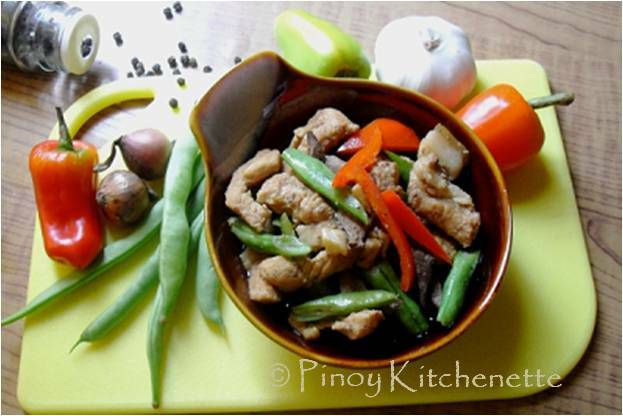 Originally this is an Ilocano dish, wherein pork meat and pork innards (heart,kidney and liver) are stewed in soysauce and vinegar. 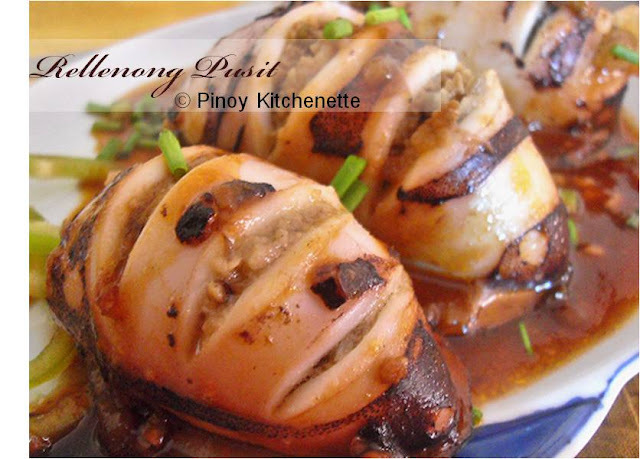 Well, some might find this kind of irky with the mention of those innards :), but this is a one must-try dish. Oh, Ok! you're not much of those in your meal, so we'll opt out some. In this recipe, we'll just be using the tenderloin and the liver (relieved , huh?). I guess Igado wont be Igado without the liver, since Igado in spanish term is Higado. This is how my father used to cook this dish. String beans and lots of green chilis are used instead of green peas. Heat oil in pan. Saute onions and garlic. 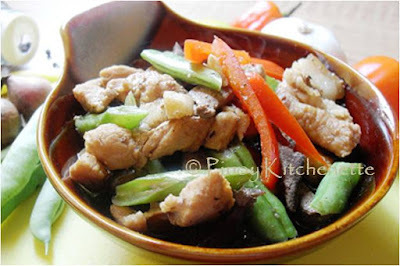 Stir in pork tenderloins. Stir-fry until light brown. Add soy sauce and water. Cover and simmer for about 10 minutes or until meat is tender. Add pork liver, vinegar, bay leaves, bell pepper and string beans. Season with salt and pepper. Add some water if it dries up. I personally like it with more sauce. 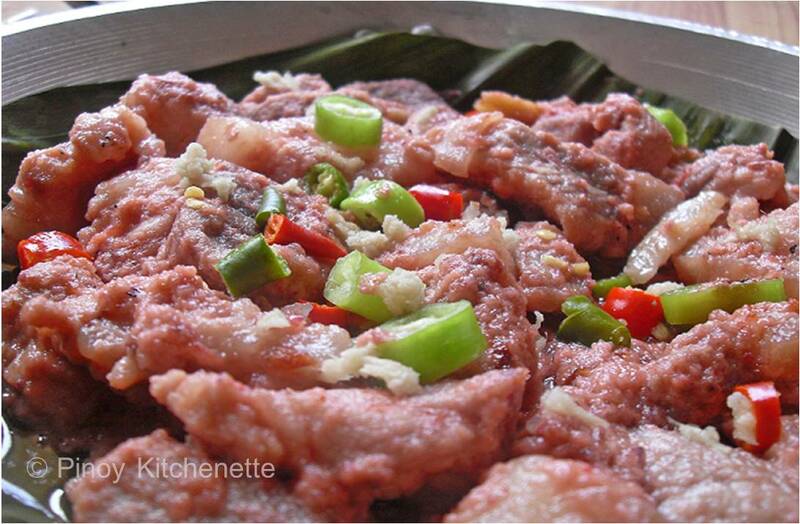 Cover and cook for about 5 minutes or until liver is cooked (don't over cook the liver). Stir in the green chilis. 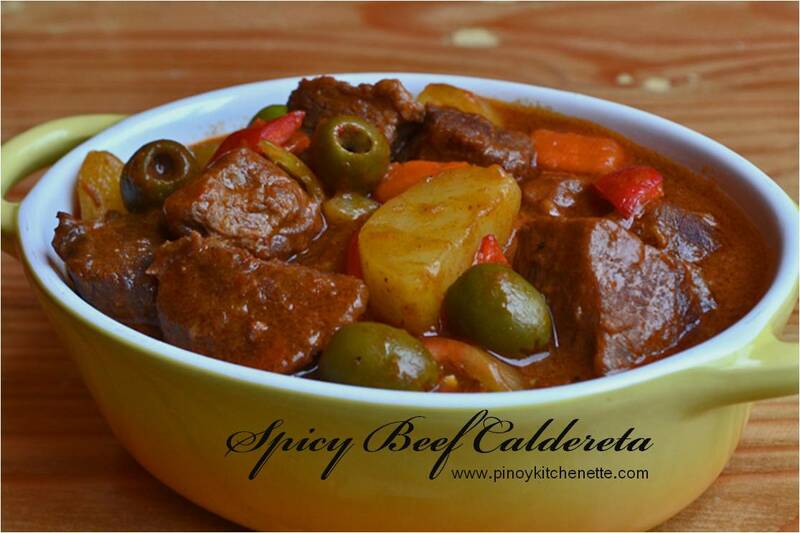 Serve with steamed hot rice. enjoy!